Before the year draws to a close, we would like to thank all those who supported the Roundwood Street Festival in August this year. The following local businesses provided cash donations to support the operating costs of the festival. The following 21 local businesses also provided prizes for the raffle. So many others gave very generously of their time, skills and equipment before, during and after the festival and without which there could not be a festival. *Donations were made to Roundwood/Moneystown Parish, Roundwood Parish Hall, Dublin Wicklow Mountain Rescue and First Responders. Every effort is made to minimise costs of the festival, however, some significant items of expenditure, for example, insurance (€1,348.90) are unavoidable and difficult to negotiate. 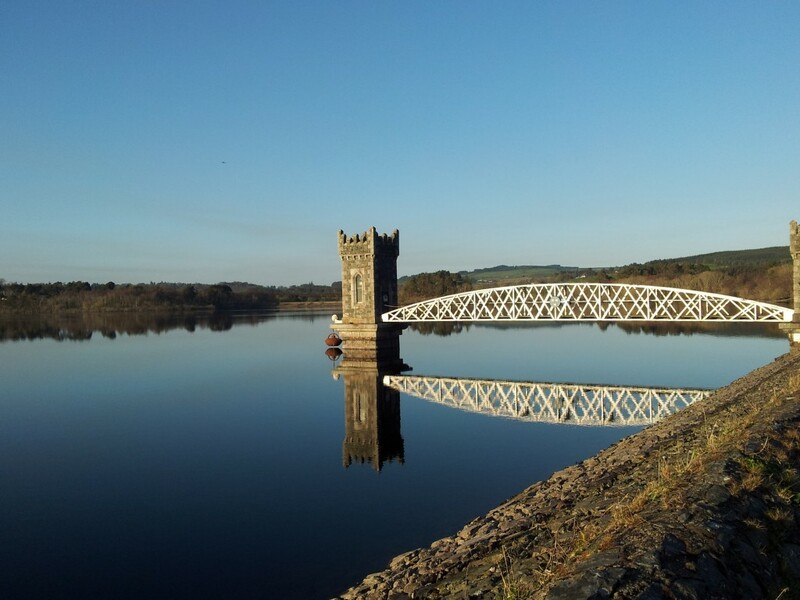 The balance of funds available following the festival will be used to fund local initiatives, for example, upgrading the trails around the Vartry Reservoir and as a reserve to support costs of the 2017 Roundwood Street Festival. Many thanks to you all for your support in 2016 and we hope you will continue to support the festival in 2017, which will be held between Thursday, 3rd and Sunday, 6th August. 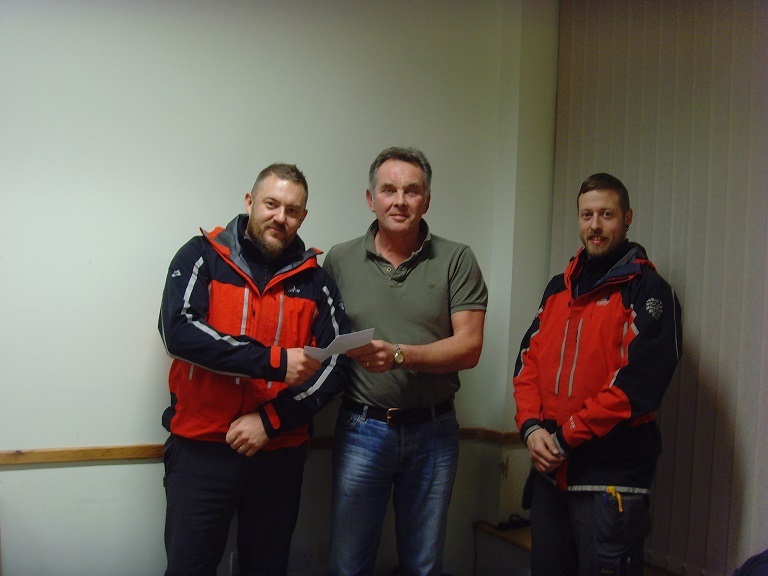 Volunteers from Dublin Wicklow Mountain Rescue receiving a donation from proceeds of the festival. This entry was posted in News & Events on December 31, 2016 by roundwoodiewicklow. The Wicklow Man will play in Moneystown Community Centre on Friday, January 13th from 9.30 pm till 12. Teas served, refreshments also available, door prizes. Come along and enjoy a night of waltzing, jive, etc. The next Roundwood Dance will be on Friday 20th January with Music by John Flood. All are welcome. Learn traditional Irish music and dance with an award-winning Comhaltas branch (guitar, fiddle, flute, tin whistle and grúpa ceoil). Classes are held at 7 pm on Tuesday nights in St. Laurence O’Toole N.S., Roundwood – the first term is from September to January while the second term is from January to May. Performances, workshops and outings take place throughout the year. For more information phone 086-8269964or emailroundwoodcce@gmail.com. Roundwood Men’s Shed continues on Tuesdays between 10 and 12 noon at Pat Carr’s place in Knockraheen. The SHED will be closed on Tuesday 3 January 2017. It will open again on Tuesday 10 January at 10 a.m. Sincere thanks to all who have helped to get the SHED up and running. For further information feel free to call 086 8650588. Rebecca Delamere will be teaching group Maths lessons on a weekly basis in the Parish Hall in Roundwood for secondary school students. Class sizes will be very small and there will be classes at different levels. These lessons provide support for students who may be struggling with Maths in school, support for students who are aiming for high grades and also prepare students for their Maths exams. To reserve a space of for further information, please contact Rebecca on 086 0650129 or rebeccadelameremathslessons@outlook.ie. A 45 Card Game takes place every Tuesday night in Moneystown Community Centre starting at 8.00pm. Teas served. All are welcome. Set Dancing continues every Thursday night in Kavanagh’s Lounge from 9pm til 11pm with music this month by the O’Kane family. Come along and join us for a night of good fun, great exercise and a very social night out. Also giving jiving lessons starting on Thurs at 8.30pmbefore our weekly set dancing session. All are welcome to these lessons.Newcomers always welcome and great way to meet some locals. Cost for night of dancing and entertainment is still only €5. A reminder that the Active Retirement Lunch club will take place on Friday 20th January in Byrne and Woods, Roundwood at 1.30. This entry was posted in News & Events on December 30, 2016 by roundwoodiewicklow. I would like to take this opportunity to wish all our readers and contributors a very Happy Christmas and a Peaceful and Healthy 2017. A big thank you for all your contributions to the notes throughout the year and to Margaret Bolger for helping out in my absence. The notes are only as good as what you contribute so thank you and look forward to plenty of news for 2017. Carol Singing for Temple Street Children’s Hospital before 10 am Moneystown and 11.30 am Roundwood on Christmas Morning. Your generous support is much appreciated. Christmas disco in Roundwood Parish Centre on Thursday 22nd December from 7pm to 9pm. Spot prizes and maybe someone special will show up!. Admission €5 and there will be a shop on the night. Next whist will be on tonight 21st December in The Parish Centre. The Calary Candlelight Carol Service will take place in the church at 7.30 pm on tonight Wednesday 21 December and will be followed by refreshments in the Church Room. We would be delighted to welcome all our neighbours and friends. Everyone in Calary would like to wish you all a wonderful and blessed Christmas. Well just a week now to our local Biathlon. So gets those bikes out and make sure you have your runners all set to go. Whether you walk, run or cycle or do all its a great day out for all the family. If you require any details contact Louise at 0862525860 or Ellen at 0868343286. After the event we are as usual in Vartry House for refreshments. Auction on the day to include a signed Leinster Jersey by all the team and a signed Leinster Jersey by Paul O’ Connell, not too many of them around. Hampers and lots more. Looking forward to seeing you all on the day. Roundwood Men’s Shed continues on Tuesdays between 10 and 12 noon at Pat Carr’s place in Knockraheen. The SHED will be closed on Tuesday 27 December and Tuesday 3 January 2017. It will open again on Tuesday 10 January at 10 a.m. Sincere thanks to all who have helped to get the SHED up and running. For further information feel free to call 086 8650588. There was yet again no jackpot winner in last weeks lotto draw. The numbers drawn were 3, 11, 12 &24 There were eleven match three winners, Breda Connolly, Graham Hamilton, T & E Gregory, Janet Langrell, Mary Molloy, A Smyth, Jets, Sheila Keane, Chris & Shane, Veronica Doyle & Joe McCabe Next weeks jackpot €19,400. This entry was posted in News & Events on December 19, 2016 by roundwoodiewicklow.